As one of the most visited tourist spots in Branson, Titanic Museum Attraction truly offers a magical and exciting tour experience for people of all ages this season. The Titanic Museum Attraction in Branson will give visitors the opportunity to get onboard this great ocean liner and see a number of 400 artifacts and countless exhibits. Visitors to this historic ship will be able to see the exact appearance of the Grand Staircase, the hallway, and passenger accommodations. Visitors who want to get onboard the Titanic Museum will be issued a “boarding pass.” This will include the information about the actual number of crewmembers and passengers. 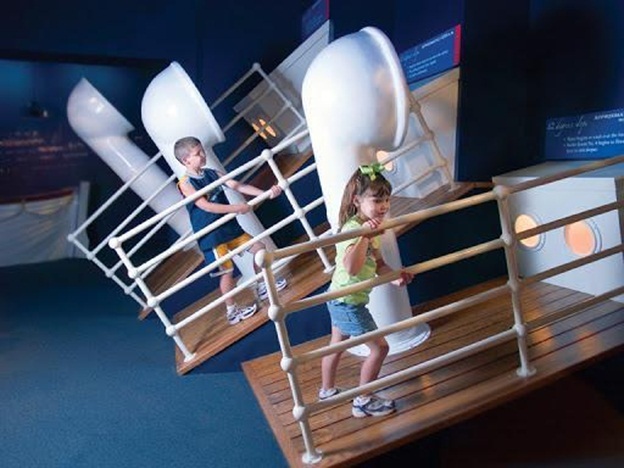 Once you are aboard the ship, you can start exploring the Titanic Museum Attraction on your own. As you step into the Grand Staircase and walk along the hallways, the passengers cabins, and public rooms, you can feel how the passengers enjoyed the luxury of ocean travel that time. The magnificent Grand Staircase was beautifully built and hand-crafted out from original blue prints of the Titanic. It is in this area where first class passengers usually converge and meet up for shipboard social functions where the rich and famous passengers gathered together before dinner. The Titanic Museum features an 18-foot replica of the ship displayed as one of the most beautiful exhibits in the museum and considered one of a kind scale model of the ship. The ship also has the replica of the Third class accommodation that will let you learn what it was like to stay in Third class cabins, where the common bathroom was located, how many people shared in a room, and also learn how much it would cost to stay in this kind of accommodation in today’s standards. The museum also features a unique and interesting exhibit of the replica of the Grand Staircase. Each guest to the Titanic Museum Attraction can have the opportunity to visit the ship’s bridge and view old equipments such as the telescope, compass, and the steering wheel. On your tour to the museum, you will learn that the RMS Titanic sunk 2 miles below the ocean floor. So, don’t miss to join the virtual tour of the ship which gives you the chance to see photos of the ship’s wreckage. The museum also has a gallery which is home to about 400 personal items from passengers. Your visit to the museum will become more memorable if you take the opportunity to touch the 28 degree waters, an iceberg, and the boiler room of the ship. The Titanic Museum also offers guests in groups for fun and exciting activity to solve the murder mystery. Each group must solve the mystery death of Officer William Garrett. Guests participating the fun activity assume the names of passengers while they search the killer among them. So, if you want to spend a wonderful vacation this autumn season, visit the Titanic Museum Attraction in Branson which offers a truly magical and exciting onboard experience with the luxury ocean liner.